When reading this article, keep in mind that many, if not most, of the “Syrian” Rebels are funded by U.S. entities. In fact, many of the “rebels”, up to 95%, are not even Syrian. They are foreign mercenaries trained, funded, and armed by the U.S. and its allies to topple the legal Syrian government. Many of these same mercenaries fought in Iraq and have ties to terrorist organizations such as Al Qaeda and Al Nusra Front. There has been some controversy over whether or not the original author of this article gave our organization permission to use this information. Here is the link to the original article on Global Voices. Scroll to the bottom and you will see that it is licensed CC 3.0. Per CC 3.0 guidelines, our organization has the right to share, copy and redistribute the material in any medium or format, and to adapt, remix, transform, and build upon the material for any purpose, even commercially. INA Press is dedicated to exposing the truth. Part of that “truth” is a dedication to making sure people understand the whole story of what is happening in Syria, and who is responsible for the destruction of the country. Many Western puppet “journalists” only publish one side of the story, which is often a whitewashed version of half-baked-truths. For example, while saying who bombed what and where, this article fails to mention who the actual responsible parties are. While pointing blame towards the legal Syrian government who was lawfully voted into power by the Syrian people, it fails to mention that foreign mercenaries make up the majority of supposed “Syrian rebels.” It is for this reason that INA Press exists. Our goal is to tell the whole truth. Aleppo’s Citadel in 2008. Courtesy of Jean-Baptiste Rabouan/Hemis.fr. Used with permission. Syria’s story is one that has been weaved through families from one millennium to the next. Subjugated as a Roman province under the command of Pompey the Great  in 64 BC, and brought under Ottoman rule 16 centuries later by Sultan Selim I in 1516, the country has experienced its share of the world’s great military conquests. The empires that vied to establish dominance over the region left behind varied architectural and cultural legacies that were subsumed into the nation’s heritage. 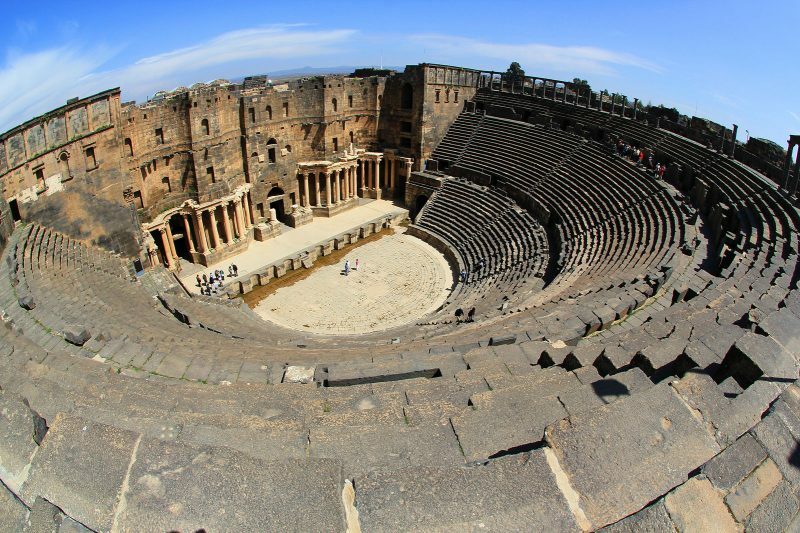 For Syrians, the experience of savoring the spices at the Souqs in Aleppo or admiring the gem that is the Roman theatre in Bosra  are birthrights. Syria’s historic sites have long attested to its riveting history. But their pulverization over the course of a six-year civil war that has claimed well over 400,000  lives and displaced more than half the country’s population means future Syrians, and the world at large, risk being deprived of this long-standing narrative. 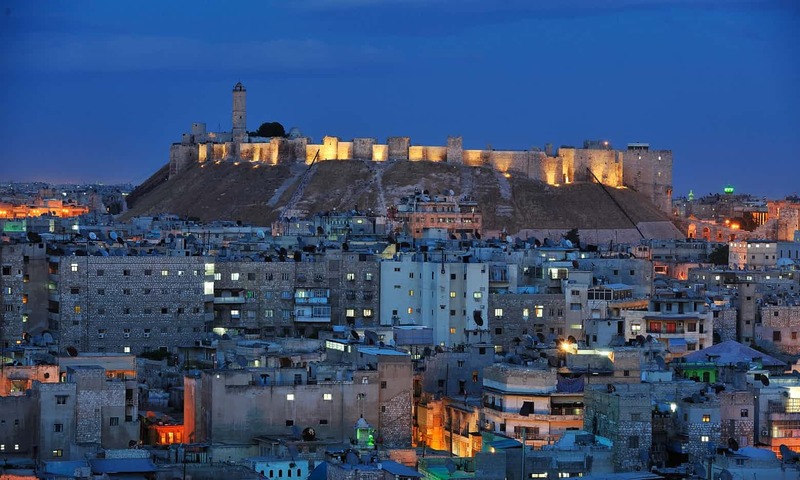 The Ancient City of Aleppo, inscribed on UNESCO ‘s World Heritage Site list in 1986, has historically served as a vibrant trading centre where commercial roads from East and West met, located strategically between the Mediterranean Sea and Mesopotamia. Its prominence in history is attributed to its location at one end of the Silk Road . One of the world’s oldest continually inhabited cities, it has experienced some of the most horrid atrocities of the war. Towards the fall  of the then-besieged Eastern part of the city in December at the hands of the Assad regime and its proxies, local activists expressed their struggle to count daily death tolls . According to the United Nations Institute for Training and Research (UNITAR ), a total of 22 heritage locations in the city were destroyed and 48 severely damaged as of 2013. In the busy bustle of Al-Madina Souq, one would typically find a colourful array of imported goods, ranging from silk to spices, and local goods including soap and wool. 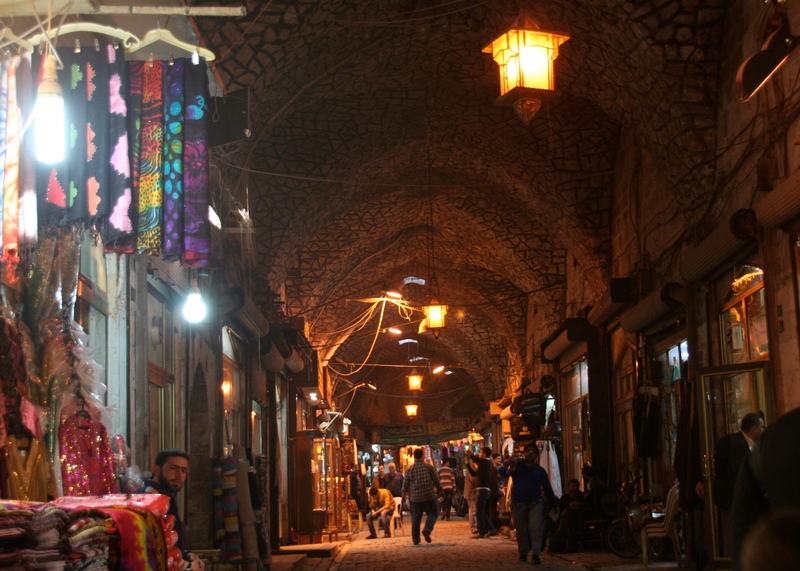 Apart from trading, the souq also was home to Khans (caravanserais), which accommodated traders along with their goods. A shot of the Souq from 2012. Credit: AMC , used with permission. In late 2012, intense fighting took place between the regime and the Free Syrian Army (FSA) in and around the Souq. 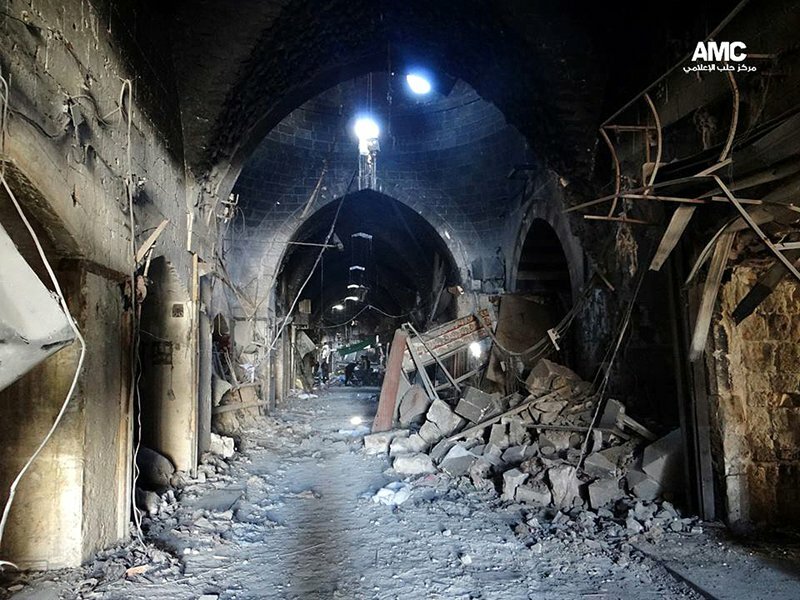 The regime attacked  the historic site using mortars, leaving it ablaze. 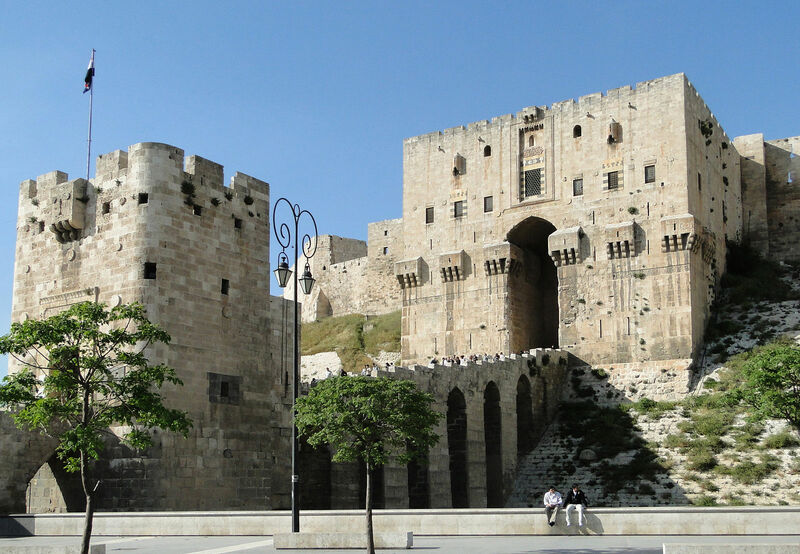 The Citadel of Aleppo is a fortified medieval castle located in the heart of the old city and considered to be one of the world’s largest and oldest of its kind. The limestone monument had fallen under the control of Byzantines, Greeks, Ayyubids, Ottomans, and others, and each of its various conquerors left their own mark on it architecturally. The citadel was shelled continually  by the Assad regime from 2012 and a bomb explosion  in July 2015 caused part of its walls to collapse. The Syrian regime and rebel groups exchanged blame for the explosion. The Great Mosque of Aleppo, otherwise known as the Umayyad Mosque, had its spectacular minaret built in 1090 and which lasted nearly 1,000 years — it was destroyed in 2013. 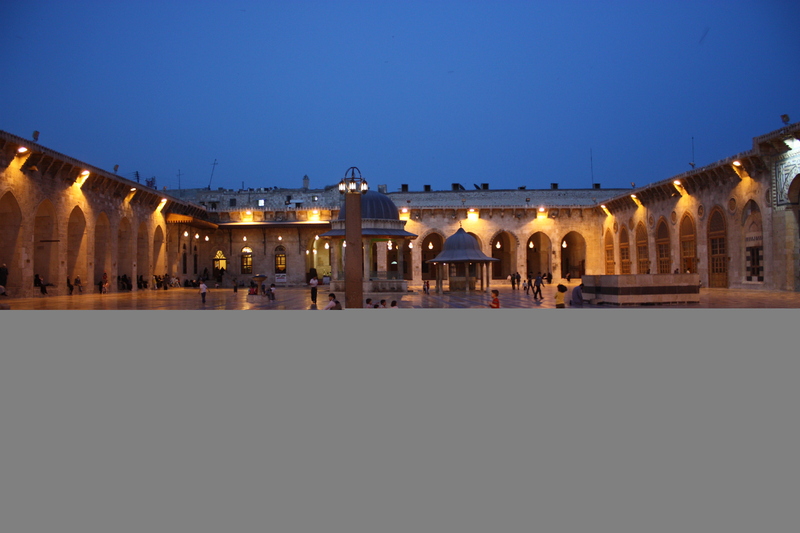 The Umayyad mosque shares many characteristics with its sister mosque in Damascus, ranging from the marble courtyard to the location on a Roman/Byzantine site. The Syrian regime, backed by its Russian and Iranian allies, persistently targeted the mosque in the battle for control of the city that raged following its capture by rebel forces in 2012. We were standing here today and suddenly shells started hitting the minaret. [The army ] then tried to storm the mosque but we pushed them back. According to UNITAR’s assessment, the mosque has sustained severe damage to its eastern outer wall, the southern part of the eastern gallery, the marble-tiled courtyard, the garden, and the entrance to the souq from the eastern gallery. This is like blowing up the Taj Mahal or destroying the Acropolis in Athens. This mosque is a living sanctuary. This is a disaster. 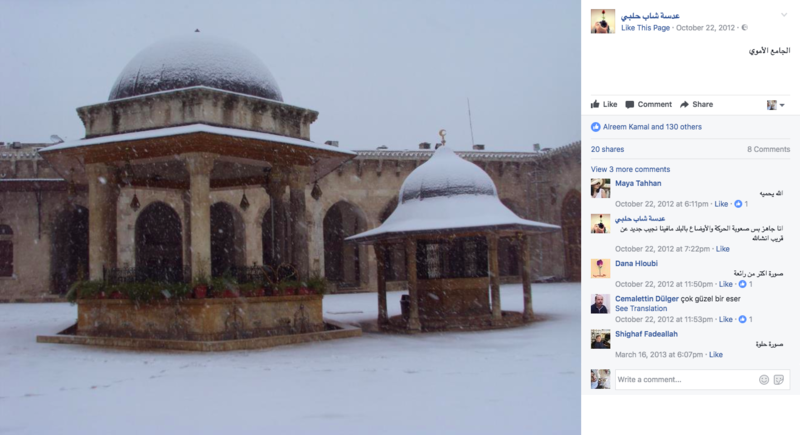 In terms of heritage, this is the worst I’ve seen in Syria. I’m horrified. Deemed a symbol of the revolution, the Daraa mosque was built in the 7th century by the Islamic Caliph Omar ibn al-Khattab. Its once marvelous minaret, now destroyed, was the first minaret in all of the Levant. The historic mosque had been the focus of anti-regime  demonstrations in Daraa and hosted a great number of protests that were consistently met with brutality from government security forces. 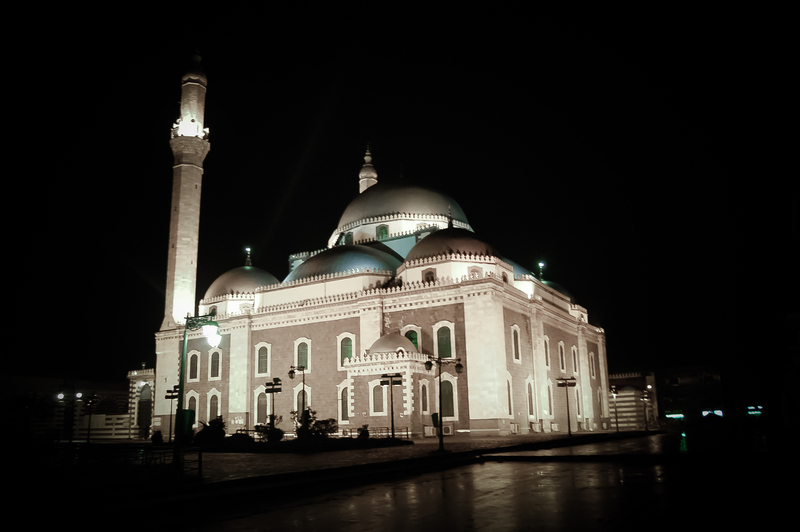 It was primarily for this reason that the regime persistently shelled the mosque, destroying its minaret, in an attempt to crush the spirits of protestors. In June, Syrian regime helicopters dropped four barrel bombs  loaded with incendiary substances on the mosque, burning its northern section. In the vicinity of this historically rich southern city lies a grandiose 2nd-century Roman theatre, some of the oldest surviving Islamic mosques and Christian ruins, too. The Ancient City of Bosra, inscribed as a UNESCO World Heritage Site in 1980 and added to UNESCO’s list of World Heritage in Danger  in 2013, was once the capital of the Roman province of Arabia and a stop-over for caravans en route to Mecca. 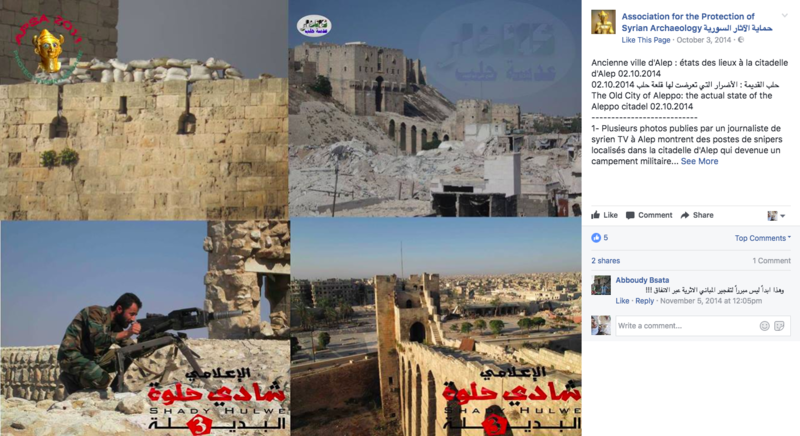 This site of immense cultural importance was bombed by regime  helicopters in 2015, causing severe damage to the ancient citadel. 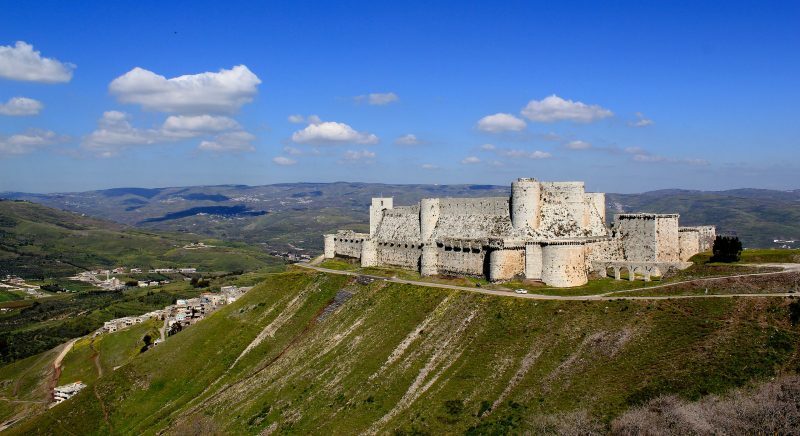 Crac des Chevaliers, meaning ‘Castle of the Knights’, is a Crusader castle in the Homs Province of Syria. Another UNESCO World Heritage site, it is regarded as one of the most important preserved medieval castles in the world. The fortified castle was built by the Hospitaller Order of Saint John of Jerusalem from 1142 to 1271 and received further construction by the Mamluks in the late 13th century . The castle has endured significant damage, especially to the Crusader chapel, due to a series of shellings and airstrikes  by the Syrian regime. 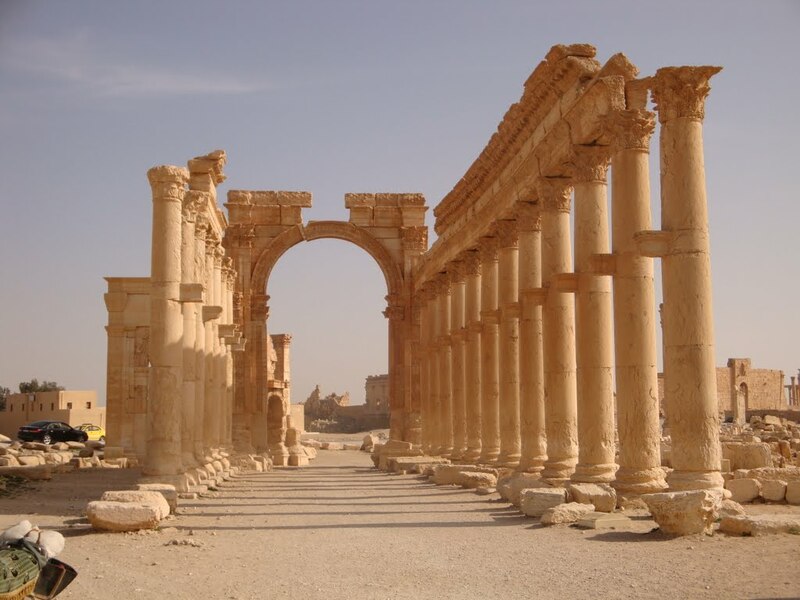 The 2,000-year-old Arch of Triumph in Palmyra before its destruction by ISIS. Source: Pixabay. Public domain. The ancient semitic city of Palmyra grew wealthy during the Roman Empire on account of its prominent merchants that operated along the Silk Road. This wealth facilitated the construction of exquisite monuments that include the Temple of Bel, Tower of Elahbel, and the Arch of Triumph. Unfortunately, all three of these monuments have endured severe damage and even destruction. 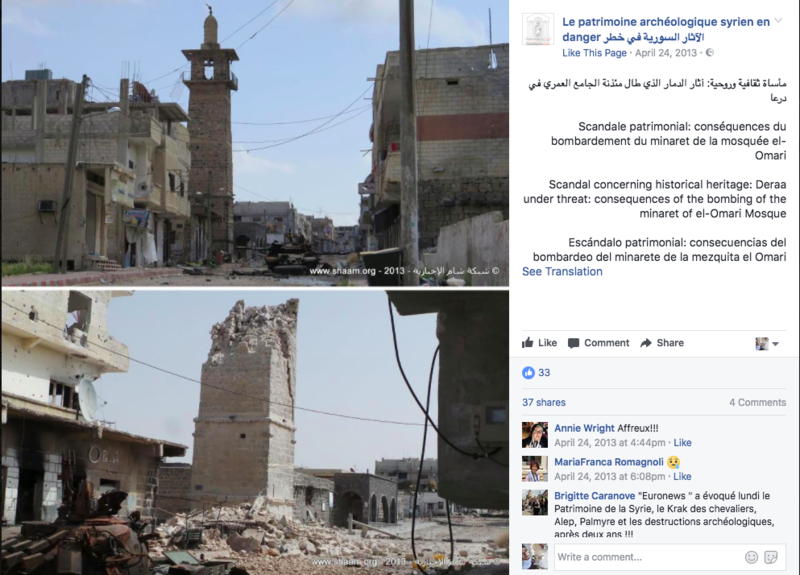 Since capturing the city in 2015, ISIS  has blown up a great number of its temples and other monuments. Once a city that captured the heart of every historian and archeologist, Palmyra now evokes a sense of mourning for a rich heritage cast aside. The Khalid ibn al-Walid Mosque in Homs is named after the Muslim Arab military commander who led the 7th century Muslim conquest of Syria that ended Byzantine rule in the country. Consecrated in 1908, the mosque is notable for its traditional Ottoman-Turkish architectural style. 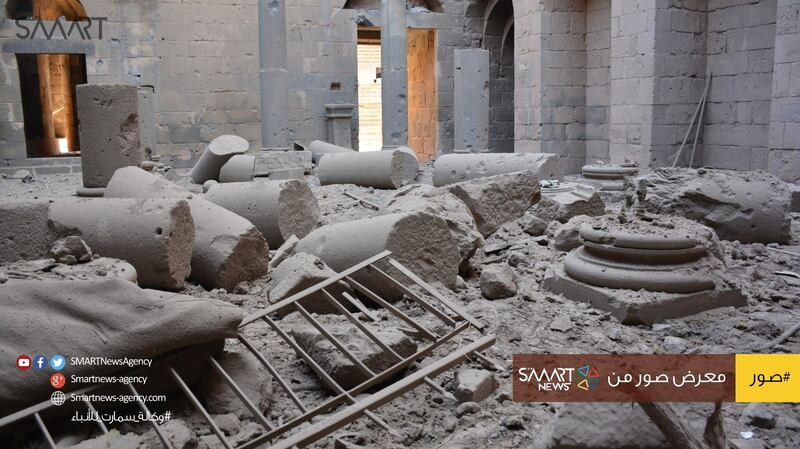 In 2013, Assad’s forces shelled the historic mosque, ultimately destroying its mausoleum . The mosque has witnessed regular attacks ever since. Click here to print story from original site, Global Voices. Uma Delavi, you are using this article without the permission of the author, as well as adding a strange disclaimer at the start that reflects nothing but your own personal bias (and has little to do with reality—the vast majority of rebels in Syria are in fact Syrian and not “paid by the US”). You should take this down immediately. Your insinuations of personal bias are completely without merit. My editor’s note is based on easily verifiable facts. I added a few links in the article above to get you started down a path to do your own research into the topic. Your demand for us to remove the article can be viewed as either willful ignorance, or nothing more than a bullying attempt to have us remove the truth. Could this be because you want to deceive people so they never find out what is really going on? You can find the original version on Global Voices. There is a link in the above article. Scroll to the bottom and you will see that it is licensed CC 3.0. There is a link in the above article. Per CC 3.0 guidelines, our organization has the right to share, copy and redistribute the material in any medium or format, and to adapt, remix, transform, and build upon the material for any purpose, even commercially. INA Press is dedicated to exposing the truth. Part of that “truth” is a dedication to making sure people understand the whole story of what is happening in Syria, and who is responsible for the destruction of the country. Many Western puppet “journalists” only publish one side of the story, which is often a whitewashed version of half-baked-truths. For example, while saying who bombed what and where, this article fails to mention who the responsible parties are. That could be because the author wants to focus solely on the destruction of Syria, or it could be because the author willfully omitted some important facts. Either way, that part of the equation is really not our concern, because that information coupled with a few other facts gives a more complete picture of the whole situation, which is what we want people to understand as they read through it and digest everything. It is for this reason that INA Press exists. Our goal is to tell the whole truth, not a whitewashed Westernized version of it.